Maria Venegas (right) and Mina Stumpfoll (middle) met at a STEM event and soon bonded over both being transfer students. For transfer students, the first months on a new campus can be like freshman year all over again. Maria Venegas, a junior transfer from UW-Parkside, feared she would feel isolated as a transfer student and woman of color on a large, predominantly white university. Being new and different “clashed head to head,” Venegas said. At STEM Immersion, a multi-day program that helps integrate new students into the STEM community, Venegas met four other transfer students who were struggling with the same things she was. The group decided to check out the Transfer Engagement Center together. The TEC is the Transfer Transition Program’s brand-new space for transfer students and students of all backgrounds to study, access resources, get advising, and build community. Operating out of 110 Middleton S. Building, a tight-knit team of students and staff work to make the transfer transition as smooth as possible. Venegas quickly formed friendships with a group of transfer students that were similar to her classes at Parkside – small but diverse, with every person from a different background. 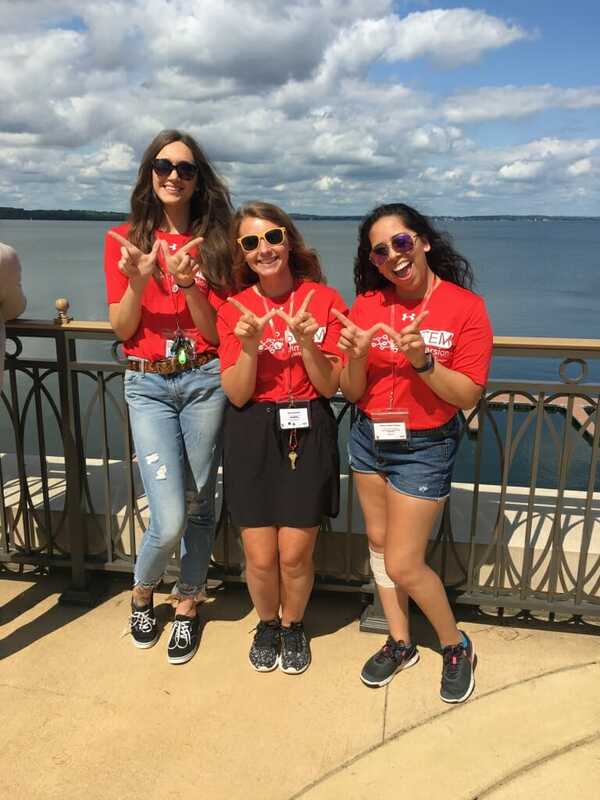 Shelby Knuth, the Transfer Transition Program Coordinator who oversees the TEC, said non-transfer students on campus mistakenly imagine transfer students to be like the majority of new students on campus – namely, white, 20 to 22 years old, and Wisconsin residents. While a portion of transfers mirror these identities, the transfer student population as a whole is more diverse, with more intersecting identities, than the “traditional” student. The transfer student population has more Pell Grant recipients, first-generation students, returning adults, veterans, student parents, and international students than traditional, non-transfer students. In fall 2017, 27 percent of newly enrolled transfer students were first-generation college students, 21 percent were Pell Grant recipients, 22 percent were international transfer students, eight percent were returning adults (25+ in age), and three percent were veterans. 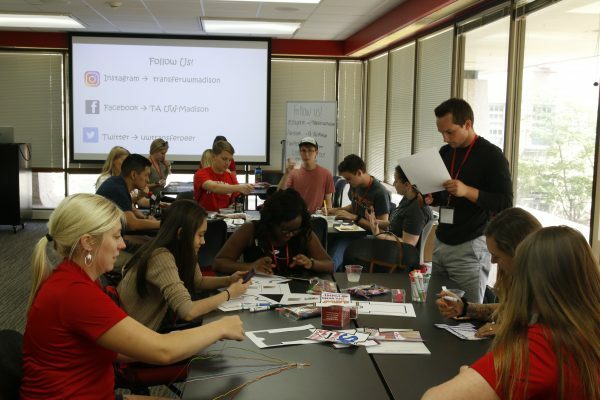 Students work on projects at the brand-new Transfer Engagement Center. Mina Stumpfoll was one of the four transfer students Venegas met at STEM Immersion. Having just arrived on campus from Northern Michigan University, Stumpfoll worried she wouldn’t make friends, wouldn’t know what was going on on campus or what resources were available, or end up lost on the nearly 1,000 acre campus. After Stumpfoll and Venegas had finished studying one night, Stumpfoll realized she didn’t know how to navigate the bus routes to find her way home and began to worry. Venegas sprang into action to help her new friend. Their first bond was formed, like many friends, while lost in a new place, together. Stomfoll instantly found the TEC to be relaxing and welcoming. She felt relief to have a place that can answer the specific questions and struggles experienced by transfer students. Now, having been at UW for several months, Stumpfoll has settled in a bit and found a few favorite spots on campus. Before the cold drove the Botanical Garden’s koi fish indoors, she would stop there between classes and relax, absorbing the beauty of the plants and the fish. Venegas said the TEC has eased her transition from a school whose biggest class held 35 students to a school whose smallest classes hold nearly that same number. The center has connected her with a lot of valuable resources beyond friends, including mental health and academic resources. The social aspect is still difficult, though. As a woman of color and a transfer student – two separate identities on campus – she said it can be difficult to fit in. Her advice to new transfer students who feel the same way is don’t be afraid to reach out for help. October 15 – 19 is National Transfer Student Week. Nationally, 38 percent of undergraduate students transfer, so if you aren’t a transfer student yourself, you likely know someone who is. Help spread love and awareness of transfer students by attending Transfer Transition Program events or spreading some much needed kindness in the world. Click this link to learn more about this week’s many fun events and #TransferActsofKindess opportunities.